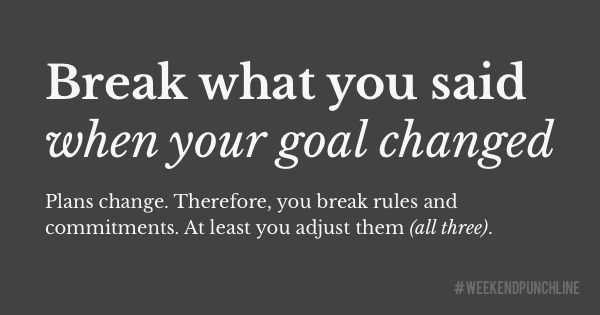 Your words don’t matter if what you said is not practical, possible to do or if you cannot execute it. What you said needs to be feasible. For example: This week in my Thursday video I said (and was sure) my goals had changed. Therefore, I needed to break the commitment of having week-daily video advices on Instagram. The day after (when I slept over it) I realized it was the wrong commitment to break. My goal had changed a bit internally but I didn’t see until the day after (Friday) that this video series is still aligned with it. Why I thought my goal changed was an idea of a show for dreaming big and executing bigger. I’ve been thinking about it for a while (and still am) but last Thursday I was sure I had found a tangible way to make it happen. I had a general topic, a show structure, a schedule plan (editorial calendar), a name and a new commitment attached it. The idea (for the show) derived from a conversation I had the night before. It was the result of an encouragement. I felt pleased by the attractive words saying something like „I believe you can have a business that makes 100,000 € in a year“. From my standpoint today that is a lot of money since I learned to live reduced and like a minimalist. But I know I want to reach the goal by 2018 since I have bigger plans (bigger goals) that require more monetary oxygen. However, the conversation / compliment / encouragment was a trap, a gem trap. Despite its good intentions it made me believe I would have to change my goal and therefore take a new road. The gem trapped me because it was a distraction. A distraction is a gem that is not aligned with your goal. In contrast, an opportunity is a gem but is aligned with your goal. The show sounded nice to have and realize but I would have to go on a new road (and build it) instead of adding the show as an element to the existing road to the goal. That’s what I did. I added the most essential part of the show I came up with to the existing road. To be precise, I thought about a weekly show reporting on building a software company while I build an actual software company. This would have required me to stop all my other smaller commitments and only work on that. Why a software company? Because I’m convinced that (next to being on-site helping with your own hands and skills) by building software you are helping people a lot and can make a good amount of money with it. Hence, 100,000 € would have been possible for me to make by 2018. I thought about the show’s first episode which I would name „Learn to program“. The moment I wrote down the title I realized that’s what I needed to do: Learning to program. I studied computer science for 7 years, know about media creation and international media but I never had real plans to be a software developer or engineer. I found this incompatible with my nature. This idea (for the show) was so fascinating and exciting that it was clear for me that the pursue of my goals as a writer would have to stop and I would have to pursue goals as a software developer. But without being at least experienced in a few software projects I wouldn’t be able to develop a complete software from A-Z (which would have been my idea of the company: design, writing, coding since I know about design, writing and would now learn to code better). I would take pro-bono projects as a start to get my feet wet as a software developer. But I would need to learn to code. Being able to code was the one prerequisite I planned to recommend people in that aforementioned show. I would be a hippocrate (read: liar) if wouldn’t be able to write code myself before actually starting a software company. That changed my thinking. I fell into my own gem trap. Also, I wanted the big and sudden change (from a writer to a software developer) being impatient and wanting the quick win instead of the slow, slong, steady and exhausting marathon. I wanted the new shiny road because it looked so promising. The old road looked dusty and used. Updating what was old and refreshing it was less appealing to me. For some reason people (I) prefer to create new things rather than update or refine existing things. I’m still wondering why that is. So, the video pieces of advices and the weekend punchlines will stay alive until I decide otherwise ;). In terms of being a software devloper, I committed to learn programming through Free Code Camp which I’ve been doing irregularly in the past months but want to take more serious on a regular basis. This was episode 10 of the #weekendpunchline . Every Saturday and Sunday.